Thanks to Sean for this review of “Shin Godzilla”, a movie that stars our favorite green mountain of doom! It’s not released out here in the Scandinavian wilds, but I’m sure keeping my eyes open for it…thanks again for the contribution, Sean! Toho’s “ShinGodzilla” opened in New York this week so I dashed over to my nearest Times Square movie theater and had a look. I’m happy to report that it’s a success! And here’s a capsule review with NO plot spoilers. 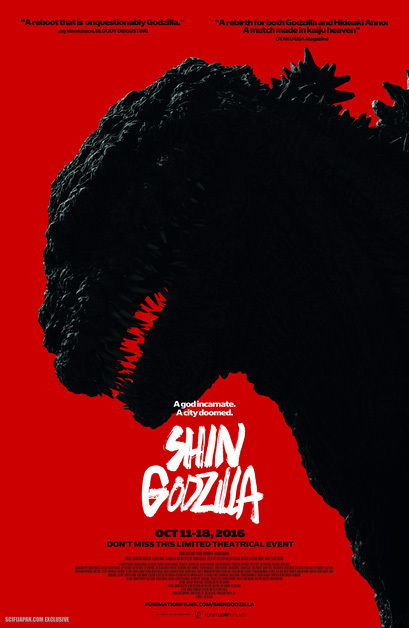 “Shin Godzilla” takes its tone from the 1954 original and gives us a serious and adult movie that asks, how would a giant creature attack on Tokyo play out in the real world? It’s therefore a very political movie, which might lead you to assume it’s bleak and cynical, but it’s not. I’m glad to report it is instead full of intelligent optimism as it tackles the faults and foibles of democratic government by taking us inside the war room of a fictional Prime Minister and his cabinet. We also follow a hastily assembled brain trust of science geeks as everyone scrambles to understand just what the heck that thing is that’s attacking the capitol. In this way, “Shin Godzilla” is the complete opposite of “Cloverfield,” which was happy to follow a bunch of pretty but annoying nobodies as they ran, argued, and screamed through the rubble. A movie “Shin Godzilla” does resemble is “The Host,” Bong Joon ho’s terrific South Korean effort from 2006. Both movies use a monster attack as a chance to examine their country’s fraught relationship with the U.S., and both movies do a fair amount of national soul searching. But whereas “The Host” was dark and anguished on this matter, “Shin Godzilla” displays a good deal of sang froid. The trailer and early PR images showed us how this new Godzilla is an imaginative reworking of the original design. The music and sound design also quote the 1954 movie, and I found this very satisfying. But there are also a number of design and action innovations in the movie. Since I went in as cold as possible, they hit me by surprise, and I think they mostly worked. Godzilla has been given a new back story, including a clever origin for the names Gojira and Godzilla. I like how this script and its scenario allow for both names. (Some Godzilla fans have, in a well meaning but too extreme search for authenticity, been campaigning to eliminate “Godzilla” in favor of “Gojira.” This is, in my opinion, a form of sacrilege.) The script also works hard to give a plausible sounding scientific basis for the action, and the effort pays off. I only have one complaint, which is that this Godzilla is no longer a tragic character. The film presents him, of rather it, as an inhuman and implacable force that is almost abstract in nature. And while this makes for a very credible threat to humanity, it leaves something of a void at the heart of the movie. It is for this reason that I doubt “Shin Godzilla” will haunt my imagination the way Godzilla does. But the movie is still an entertaining success, so thanks to writer/directors Hideaki Anno and Shinji Higuchi and to the entire production team! Nice capsule review! I must admit, I have no idea what “sang froid” means. I feel that googling it would be cheating! As a kid, we always annoyed my dad until he dropped us off at the local theater to see “Godzilla” movies for a buck. We snuck candy in and drank from the fountain, but I reeeeeeaaaaly wanted popcorn! Now that I can afford my own, I always buy the big bag o’ corn! Godzilla scared me as a kid, he was invulnerable, save an occasional flesh wound from other monsters. I was more into Gamera, friend to children! 1. I suggest you go ahead and cheat. 2. Gamera over Godzilla!?! OMG! 3. Congrats on the big bag o’corn. Really enjoyed Shin Godzilla. Nice commentary on Japanese democracy. Enjoyed Godzilla’s transformation within the film. And really dug the female scientist. Love the fact that there were no X=ray maser canons, giant robots or superjets to attack Godzilla! I’ll check with FedEx. I watched it on my Kodi box last night, and was pleasantly taken back to my 12 year old self. I didn’t like Godzilla’s first incarnation on land, he looked …comical. Then he mutated into the Godzilla that scared the bejeebus out of me, and I actually rooted for the big guy. It seemed to me that the Japanese government was hoping that the U.S.A. was going to solve the problem for them, and when they failed the high council was mad about that. Great capsule review! The special effects ranged from eye popping to aw, c’mon! You’re all missing the major flaw of this movie … and that is: Too much ridiculous talk and not enough monsters! The majority of the movie is guys in business suits sitting around discussing the problem … rather than spending more of the movie time viewing the giant monster doing what giant monsters do best. And yes, the first incarnation of Godzilla in this movie was laughable. The final incarnation was great!